Well the first work day of 2010 proved to be an evening of paying homage to the great cuisine of France. Way back in 1949 Julia Child arrived, with her husband Paul, to the shores of Normandy, where she tasted true French Cooking for the first time at Rouen’s oldest hotel. She described biting into the Sole Meuniere as an ‘opening up of the soul and spirit’. We thought fitting that we would create Sole Meuniere tonight in order to welcome ourselves to fabulous firsts and new adventures as well. The thing about this dish is that the butter has to be HOT, but NOT too HOT. The butter should be JUST starting to brown when you add the Sole. Always make sure that the Sole is dry before dredging it in the flour. AND you can create your own lemon zest by using a pototo peeler on your washed lemon. It is strong and you shouldn’t nee much! This is delicious and EZ…another 5 out of 5. 🙂 It takes all of 15 minutes to prepare! Heat butter in a large Saute Pan until almost brown. It has got to be hot but not too hot. Dredge Sole Fillets in the flour mixture and place in hot pan. It should sizzle! Cook two minutes on each side. Carefully flip (use a spatula and fork). Mix well for 30 seconds in pan. 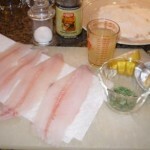 Plate the fish and drizzle the sauce over it, then sprinkle with fresh parsley. 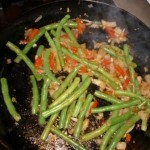 We served it with French Green Beans and Homemade French Bread (Tim will have to give those recipes!!). 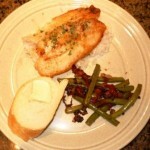 This entry was posted in Cooking and tagged Fish, Meuniere, Sole. Bookmark the permalink.